Perhaps the best translation of the Chinese word qi is provided by Einstein’s equation, e=mc2. According to this equation matter and energy are convertible. In places the material element may be to the fore, in others, what we term energy. Qi embraces both. The philosophical use of the term derives from its popular use but is nonetheless distinct. In popular parlance qi is applied to the air we breathe, steam, smoke, and all gaseous substances. The philosophical use of the term underlines the movement of qi. Qi is both what really exists and what has the ability to become. To stress one at the expense of the other would be to misunderstand qi. Qi is the life principle but is also the stuff of inanimate objects. 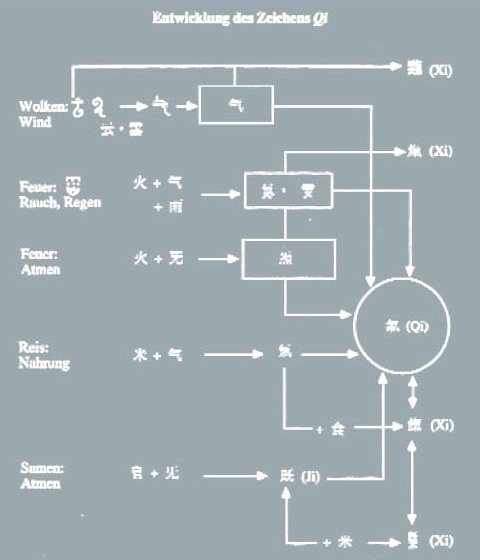 As a philosophical category, qi originally referred to the existence of whatever is of a nature to change. This meaning is then expanded to encompass all phenomena, both physical and spiritual. It is energy that has the capacity to become material object while remaining what it is. It thus combines “potentiality” with “matter”. To understand it solely as “potentiality” would be wrong, just as it cannot be translated simply as “matter”. So Qi is both matter and energy; it is the seen and the unseen, the form and the formless, the manifested and the un-manifested, the tangible and the intangible, etc. From what we can see, we can contemplate what we cannot see, from we can cannot see, we can also contemplate its potential manifestations. But unlike Einstein’s’ equation, there is no one fixed and measurable constant we can rely on, instead we make up correlations to investigate the relationship between the two Yin and Yang aspects of the same Qi and the answers are often, depending on the circumstance, more than just one predictable result, which Science demands and is not possible with correlative thinking. The Chinese made the assumption that everything has Qi and everything that has Qi has Yin and Yang as well. If there is one predictable outcome then there is also many un-predictable counterparts running side by side, so if Science can give us a predictable answer, then Non-Science like Art, its complementary opposite, will always give us more than one “non-answer” answer to the same question, because to the Chinese, even a constant is constantly changing and evolving (“the only constant is change”) and Qi is often used to express this idea, hence some scholar would also equate Qi with the Dao, which is the Way and not the Destination. “The life quality of architecture, like the life-quality of humanity itself, exist not only in the realm of the material but also in the realm of intangibility, the realm that each man must find and conquer for himself”. In other words, it is finding the Qi in ar-qi-tektur (or the Chi in ar-chi-tecture) and it is this process that transforms a building into architecture! A system of variance gets established, serving as a frame or structure for the differences. The two complementary antipodes are opposed to each other. They constitute the extreme wherein everything develops. A meticulous inventory of the diversity is raised. With endless patience the being of the situation gets investigated, to find out the essence (本性) to draw its secret. With this typology, a downright system of coherence is captured. This system is based on the oppositional- complementary relations of yin and yang. Each item or aspect is designed in reference and answer to another. Relevance evolves from their (inter)relation. The objective/aim is to make the specific potential perceptible and operant through grouping and configuration by developing and diversifying the interplay of Yin and Yang. 1) “Qi” seen as a “concrete thing” – a definite object in contrast to the Dao, which has neither spatial restriction nor physical form, that which is manifested. For example, the weather (Tian Qi) or our breath (Qi) are forms of manifested qi. 2) “Qi” seen as a “subtle, incipient, actuating force” which is not yet visible – that which is hidden. For example, the term “Xing Qi” in Feng Shui where ‘Xing’ is refer to the physical form of an object and “Qi” is its formless quality hidden behind the form. 3) “Qi” seen as a “material force” that has both matter and energy, as opposed to the concept of “Li” or Principle. For example, in TCM, Qi denotes the psycho-physiological power associated with blood and breath – Vital Qi that keeps us alive. 4) “Qi” seen as a “concept of synergy” – a “field” of different things that are not related but finally connected together. So when we say this house has “Sheng Qi” it means a certain set of conditons is being satisfied to make the place come alive. The Chinese often add an extra character to the character Qi to give it a more precise meaning. For example, the ones I mentioned: “Sheng Qi”, “Vital Qi”, “Xing Qi” and “Tian Qi”. One has to be careful in what context or situation the word Qi is used, for example, the term “sheng qi” mentioned ealier, it could mean being angry when you are having an argument with your girlfriend or it could mean a field of life enhancing qi when you are doing a Feng Shui consultation.